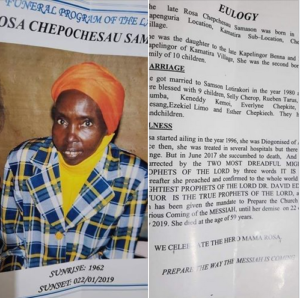 The elderly woman from Rift Valley died this week ,a year after she was resurrected by Prophet Owuor.Rosa Chepsesau,who hails from Kamatira Sub-Location died in 2017 and according to people near Owuor,her family called for help. The Mighty Prophet of God(as his followers refer to him) hurriedly visited the area, prayed hard and Mama Rosa was resurrected. 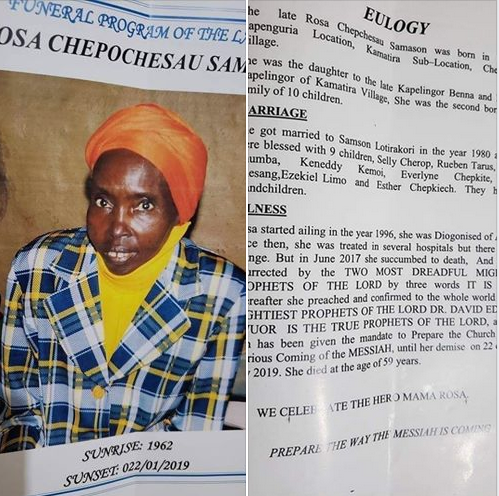 After Mama Rosa’s Death Kenyans have asked Prophet Owuor to resurrect her if he is a man enough.They have vowed to shift from their churches to his church when Mama Rosa is raised from death.But Owuor has not uttered a word—he’s gone underground. Even reaching him now is like trying to talk with Jesus face-to face. Owuor,who claims to be a true prophet of God,has been riding on his free miracles,we are now waiting for him to do the last miracle that will make Kenyans believe him—raise Mama Rosa!